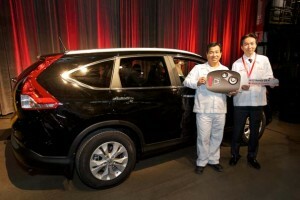 After many external obstacles and a prolonged delay, Honda Canada has finally announced that it has begun building the all-new 2012 CR-V at it’s Alliston Ontario plant. The first unit rolled off the assembly line on January 23, 2012. The CR-V joins three other models, (the Acura MDX and ZDX as well as the Honda Civic) being produced on the line at the central Ontario plant. This is the first generation of CR-V produced in Canada for the Canadian market. Being the second most popular model in Honda’s line up, the redesigned CR-V couldn’t arrive fast enough to populate dealer showrooms. Honda’s production volume had been hit hard by supply chain issues caused by the Japanese Earthquake/ Tsunami, as well as the Thai floods last year. In November 2011, Honda celebrated 25 years of manufacturing in Canada at its facilities in Alliston, Ontario. Since 1987, Honda has built close to 6 million vehicles and invested more than $2.6 billion in Canada. The company also purchases more than $1.1 billion in goods from Canadian suppliers every year.